Pho, the popular Vietnamese noodle soup made with beef, a spiced broth and fresh garnishes is wonderful but also wonderfully filling. Sometimes a little too much. Yet the flavors are so good. I created this salad as a way to enjoy them without filling up on noodles. 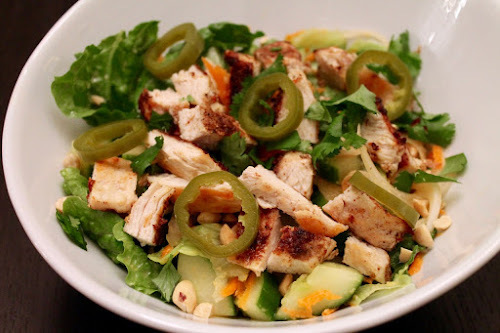 The salad also uses chicken instead of beef, although I bet a version with beef, such as broiled flank steak, would be really good too. Since there aren't noodles here, this isn't pho. More like "faux" pho. 1. Combine star anise, cardamom and coriander in a small frying pan over medium and toast until the spices are fragrant, shaking the pan occasionally, about 2-3 minutes. Allow to cool then transfer to a spice grinder and grind until fine. Combine with the cinnamon and garlic powder and set aside. 2. Heat 2 tbsp. vegetable oil in a medium frying pan over medium heat. Pat chicken dry with paper towels and add to the pan. Season with the ground spice mixture, salt and gochugaru. Cook until the chicken is browned and cooked through, about 10 minutes, turning halfway through. Set chicken aside on a cutting board, then slice into bite-size pieces. 3. Combine lettuce, carrot and cucumber in a large bowl. In a small bowl (I like to use a 1-cup glass measuring cup), whisk together the remaining 2 tbsp. of vegetable oil, lime juice, sesame oil, ginger, honey and a small pinch of salt. Pour dressing over the salad and toss to combine. 4. 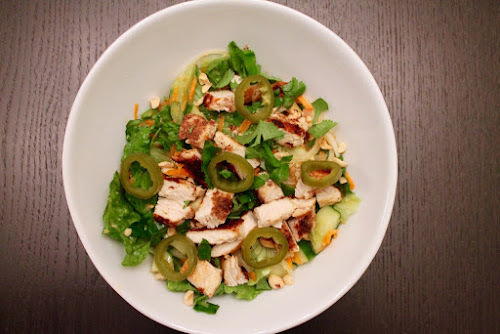 Divide the salad between two bowls and top with half the cooked chicken, peanuts, cilantro and pickled jalapeño slices. Cut off both ends of the peppers. Using a paring knife, carefully cut through the ribs on the inside of the pepper and remove the ribs and seeds, leaving the peppers as long tubes. Slice the peppers into 1/8-inch rings. Bring remaining ingredients to boil. Add the sliced jalapeños and remove from the heat. Allow to cool for about 10 minutes, then transfer to a container to store in the refrigerator until ready to use (can be made up to a 1 day in advance).